Scandinavia is a unique region in Europe complete with stunning nature, modern and interesting cities and a high standard of living. Most visitors travel to Scandinavia in the summer months to see the Midnight Sun, or around Christmas to visit Santa Claus and enjoy the Northern Lights. That said, the Scandinavian countries (Denmark, Norway, Sweden and Finland) are great vacation destinations throughout the year. 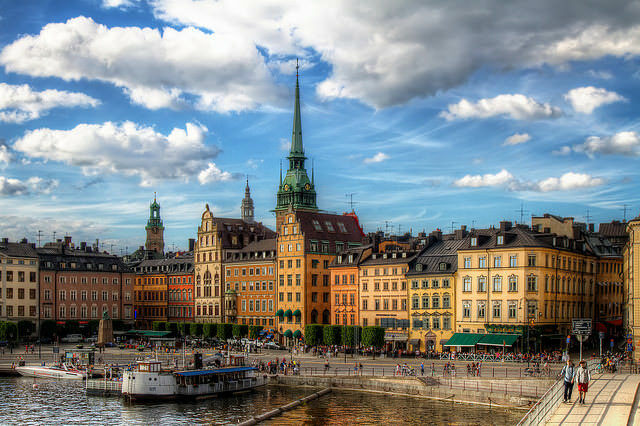 A good place to start any trip to Scandinavia is one of the capital cities: Copenhagen in Denmark, Oslo in Norway, Stockholm in Sweden and Helsinki in Finland. All capitals have their own atmosphere and character. They all boast a rich heritage of historical and modern architecture, with interesting art galleries and museums for a spot of culture. Of course, there is also a fantastic selection of great food, good shopping and a vibrant nightlife. Try Copenhagen’s ARKEN Museum of Modern Art, Oslo’s Akershus Castle, Stockholm’s Royal Palace or the Helsinki City Museum – to name just a few highlights. After you’ve explored, try local dishes like the Danish smørrebrød with herring or Finnish dishes containing elk and reindeer. The Nordic countries are known for their beautiful nature, with Finland and Sweden being especially famous for their scenic lake regions. You can even hire a traditional wooden cottage by a lake for your summer vacation and enjoy swimming, fishing and a quiet weekend in a comfortable cabin. In Finland all summer cabins come with a sauna. All Nordic countries are excellent destinations for those who enjoy outdoor activities, and the options for active vacations are almost unlimited. In the summer you can hike in the dozens of national parks, camp by the sea or go fishing in the rivers and lakes. In the winter there are good opportunities for skiing, snowboarding and other winter sports. Lapland is perfect for families in the winter months, thanks to the many winter sports that both kids and adults will love: cross-country skiing, snowboarding, reindeer safaris and dog sledge rides. Alpine skiing is also possible in Finland. Although this small country does not have high mountains, it has a long skiing season and guaranteed snow from October to late April or early May. Plus you can of course venture on trips to Lapland to meet Santa Claus and really step up the magic. The Northern Lights (Aurora Borealis) is a phenomenon that attracts visitors from around the globe. The best times to see the Northern Lights are late fall (October and November) and the late winter or early spring (February and March). In the summer, Lapland is popular with visitors who want to see the Midnight Sun: the sun does not set at all for weeks or even months in the northernmost part of Finland. There are many summer activities during these months of continuous daylight, including hiking, fishing and camping. Catch up with what Santa is doing all year round with this great little tool! Visitors to Scandinavia can easily see more than one country during a trip. It is easy to travel around Scandinavia and the distances between the countries are short. Frequent flights connect all of the major cities, and there are ferries and trains that connect the Nordic countries to each other. Ferry trips are especially beautiful in the summer when ferries transport visitors through the scenic archipelago between Finland and Sweden. So what are you waiting for? Put Scandinavia on your list at any time of year to have a rich holiday experience. Kelvin Gladstone is a backpacker and adventurer who loves extreme sports. Skydiving is his favorite thrillseeking activity.